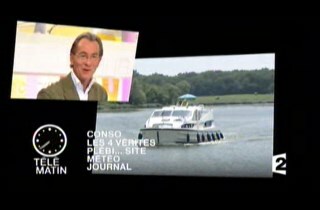 By means of introduction to river tourism, you will find below a report made by France 2 for a show called TéléMatin, presented by William Leymergie (in French). During the holidays, a cruise is the ideal way to be reunited with the water, air, light, nature and the sun, without being too far away from the towns which are full of history, architecture and gastronomy. 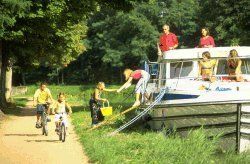 The river tourism takes place on house-boats (smaller than barges), called barges or house-boats, the official yet little-used name being "pleasure barge". They are more and more comfortable: some can be rented all year round. They are perfect for get-togethers with the family or friends and for spending unforgettable holidays ! 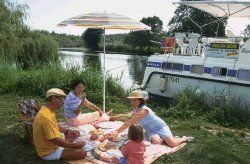 You will appreciate the onboard meals, picnics or gastronomic outings, you can swim, fish, walk, cycle or horse-ride along the river-banks. 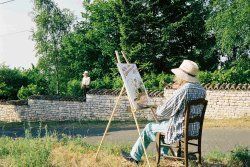 River tourism means simplicity, relaxation, rest, but also alongside a canal or river, tourists can learn more about the culture, discover a region, its wildlife, its vegetation, and its particular industrial or agricultural activities.